The PC3400 is the first Particle Counter designed for use in drinking water treatment plants that has truly made the calibration process uncomplicated for the end user. Simply access the calibration features via the front panel keypad and perform automatic sizing calibration of any selected size range in seconds. No computer or software is required. With the PC3400, the customer is no longer dependent upon the manufacturer for calibration of their instrument. The PC5000 Particle Counter/Portable Sampler has the capability to operate as both a grab sample particle counter (lab or field use) and an online particle counter, which makes it ideal for particle size and concentration analysis in a variety of municipal and industrial applications. The PC5000 can size particulates from 2 to 125 microns and count particulates from 2 to 750 microns. With the ability to detect particles at low part per trillion concentrations, the PC5000 offers superior analytical performance at an economical price compared to most other laboratory type particle counters. 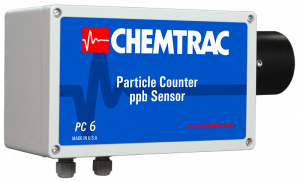 ​​The PC6 Particle Counter Sensor, when combined with a HydroACT analyzer, brings many of the same great features of Chemtrac’s stand alone models (i.e. PC3400 & PC4400) to the HydroACT family of analyzers. This allows the user to integrate multiple particle detection sensors into one analyzer, or mix and match with other measurements of water quality like pH, chlorine, and UV254 organics. The PC6 also comes standard with volumetric concentration (ppb) measurement capability. 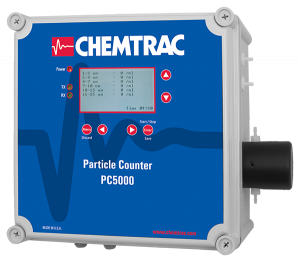 The PC3 Particle Counter Sensor, when combined with a HydroACT analyzer, represents the most affordable option in Chemtrac’s family of Particle Counters where multiple sample monitoring points are required. For larger installations, 4 to 12 sensors (depending on number of size channels used) can be connected to a single HydroACT 1200 analyzer.